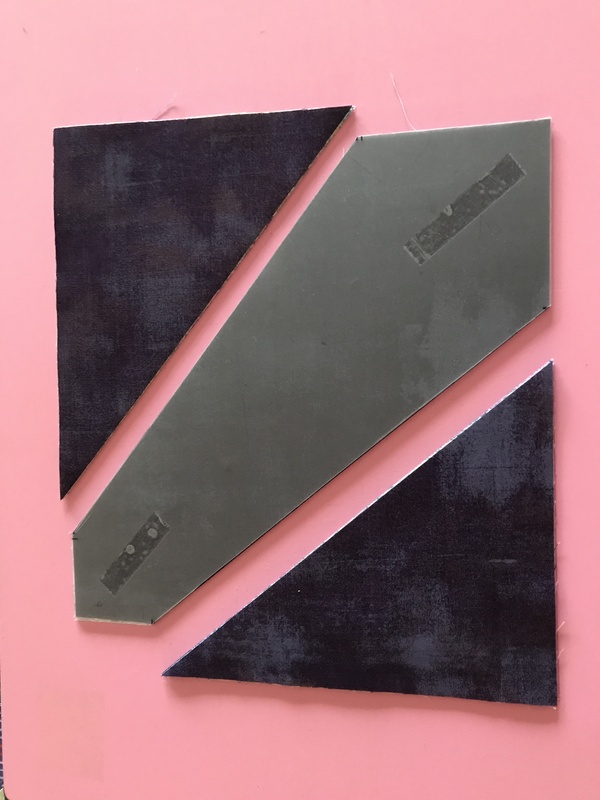 A while ago I came across a photo of a quilt constructed from a block I thought was interesting – two equal diagonal cuts creating three pieces – two triangles and one six-sided, double pointed polygon. In the photo, the triangles and polygons were mixed and matched in the piecing of blocks. The blocks appeared to be perhaps 15+” square (the quilt was a 3×3 array incorporating solid blocks, sashing and borders). A block that size is problematic for me because the widest embroidery hoop I can use for quilting is 250mm (a shade under 10″, my preferred hoop is 200mm square (~8″). So my plan was to downscale the blocks to a size I could manage. 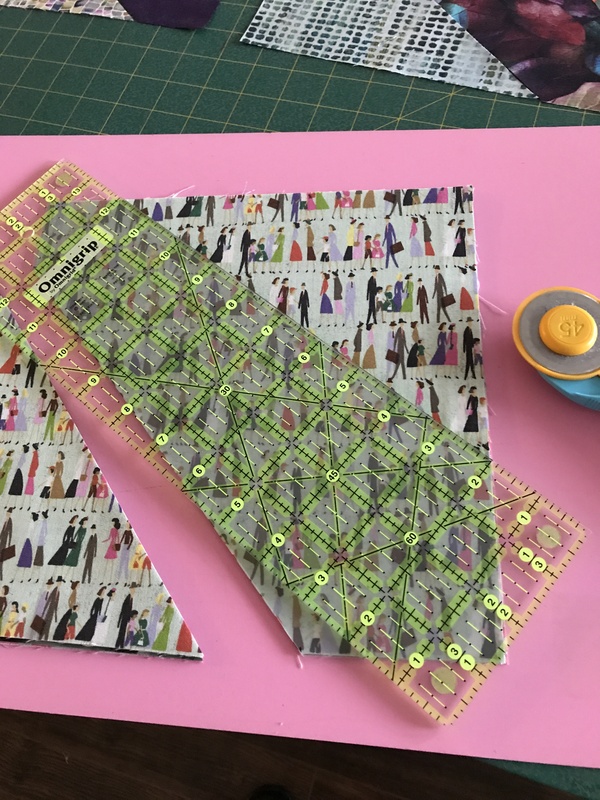 I created four 9.5″ squares from 10 different coordinating fabrics. 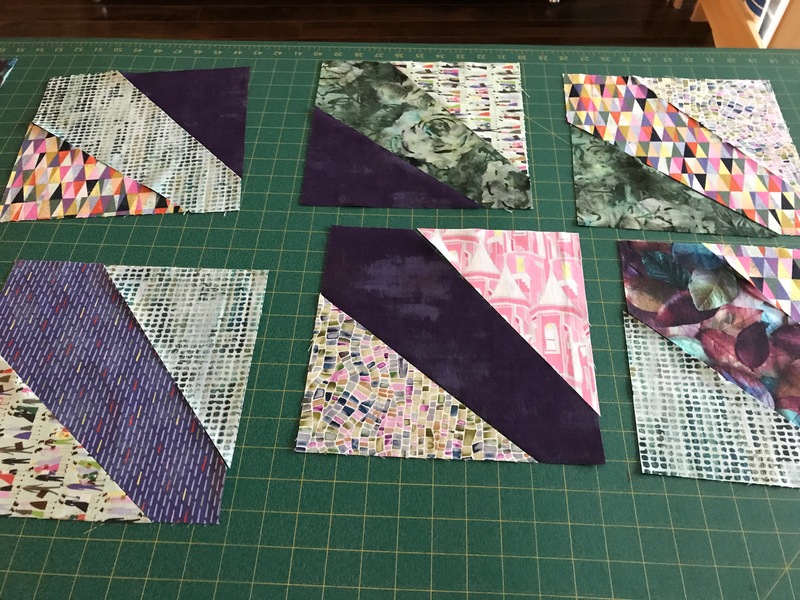 To cut these blocks into sections I realized I needed a template of some kind so I constructed one out of quilter’s template plastic. 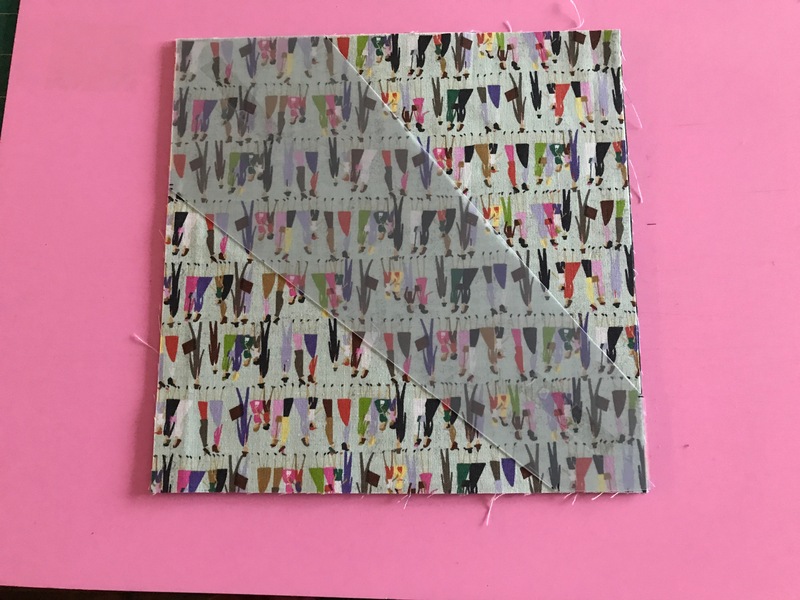 To keep the template securely positioned, I used double sided tape on the back which stuck it to the top layer of fabric (I was using a “stack ‘n whack” technique so the triangles were interchangeable). The template plastic is not thick enough to use with a rotary cutter, however, the edge of the template provided me a reliable guide for positioning my ruler. 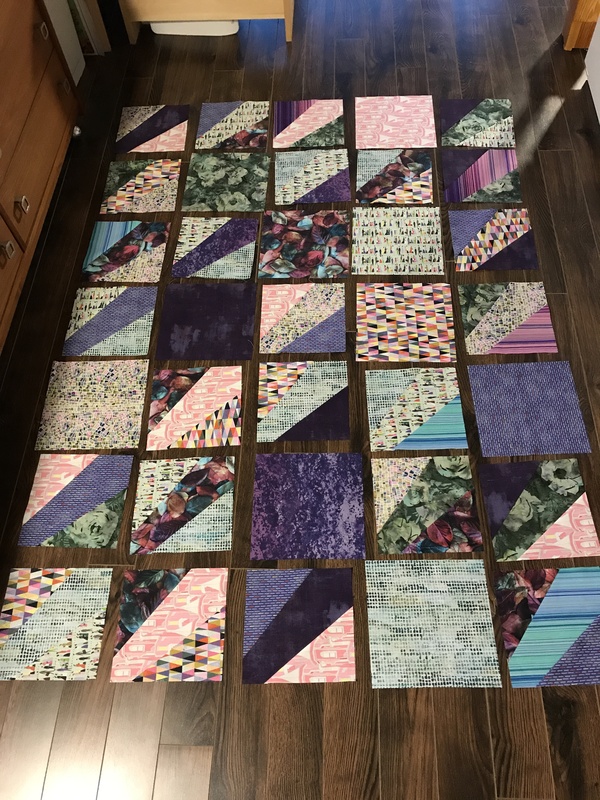 I chain pieced the blocks – sewing one triangle to one side of the polygon, pressing, then sewing the second triangle to the other side, pressing, then trimming the resulting blocks to 8.5″. I now have a 5×7 array on my floor. I have two interesting pieces of turquoise fabric that coordinate well with the fabrics in the blocks which I plan to use for sashing. I also have lots of dark purple grunge fabric (Moda) for a wide border. What I haven’t decided is whether the polygons should all point in the same direction or whether they would be more interesting pointing in all four directions – at the moment they’re pointing the same way. I can also see from the photo that I have to revisit the block distribution because the pink bits are clustered. I have six extra blocks which I might substitute for a few of the pinks. Lots of headway on this quilt today. I’ll pick it up again tomorrow. Oh, and I finished the binding on the strip quilt yesterday, as well.